« Why does “Creating Citation…” appear when I want to add a reference? How to resolve duplicated references? As you may know, there is no real BibTeX standard but lots of different dialects and styles. Zotero for instance creates BibTeX references with un-escaped semicolon or colon characters, although they are used to separate multiple files from each other and to separate meta information like the file’s description and the file type from the actual file path. 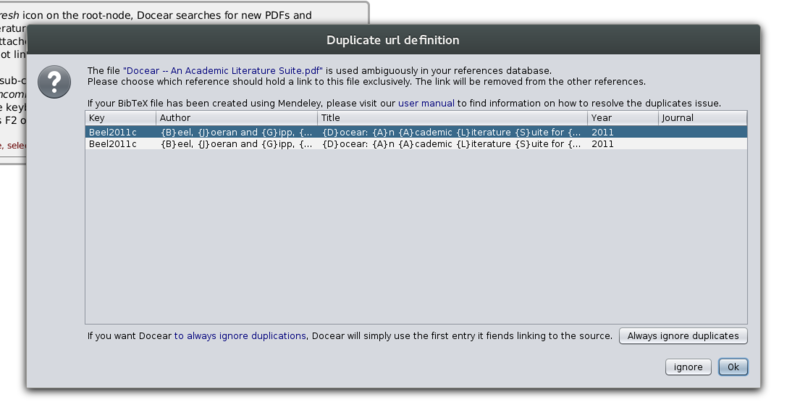 You can now select that you want Docear to always ignore duplicate references. Instead of manually resolving them and leaving only one reference per PDF document or URL that Docear can find unambiguously, Docear will always use the first reference it finds in your Library. This means you don’t have to worry about duplicates in BibTeX files created by Mendeley. This also means that you might link different references in your mind map files, however, we think that this should not be a big problem, since the references are duplicates and hence should contain the same data.